On the Orchestra's recent trip through Germany it performed together with the male choir 'Liederkranz Strassdorf'. The packed hall in Schwaebisch Gmuend enjoyed a wonderful concert, and so did the artitsts on stage. The choir joined in with some classic Pasadena Roof Orchestra tunes like 'Lucky Star' or 'Just A Gigolo' giving the orchestra a new sound, and performed convincingly on its own with a segment containing well-known songs from the 'Comedian Harmonists'. 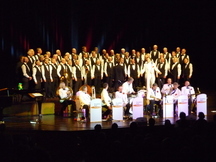 Bandleader Duncan Galloway joined the choir for the finale with 'Tiger Rag'. The choir parts were excellently arranged by the Orchestra's pianist Simon Townley. Well done boys!